To monitor and manage the HANA databases for the complete landscape, we installed HANA Cockpit 2.0 SP 06 patch 04 on a separate/dedicated server with 32 GB of RAM. 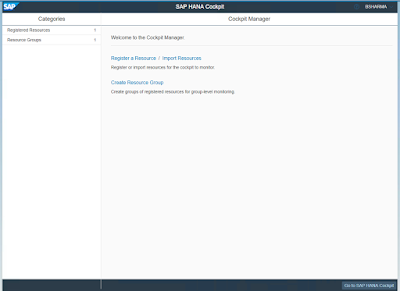 Once the Cockpit instance is installed, we created resource groups and resources via SAP HANA Cockpit Manager web URL. 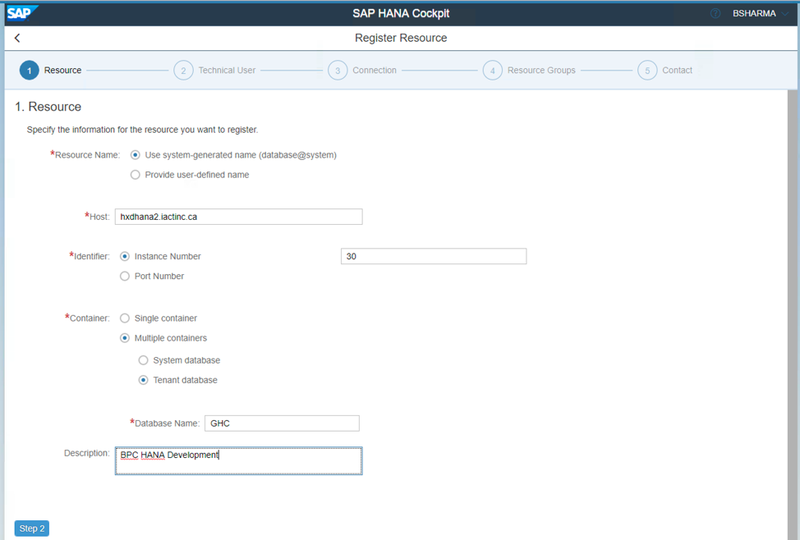 A resource is the remote HANA database which we want to monitor via HANA Cockpit and a resource group is a group of commonly managed HANA databases for group level monitoring. For e.g. we planned to manage all BW/BPC non production HANA databases via a single resource group. 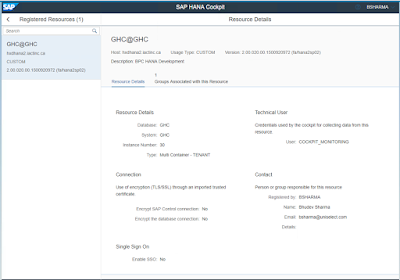 So, we added all non production BPC HANA databases as ‘resources’ in the HANA cockpit and then we assigned these resources to the resource group. 2. We are able to login the cockpit manager via the default cockpit user cockpit_admin or with our individual cockpit user created, for e.g., bsharma. 3. Logged in user (cockpit_admin or bsharma) should have the authorizations/roles such as Cockpit Resource Administrator and Cockpit User role. 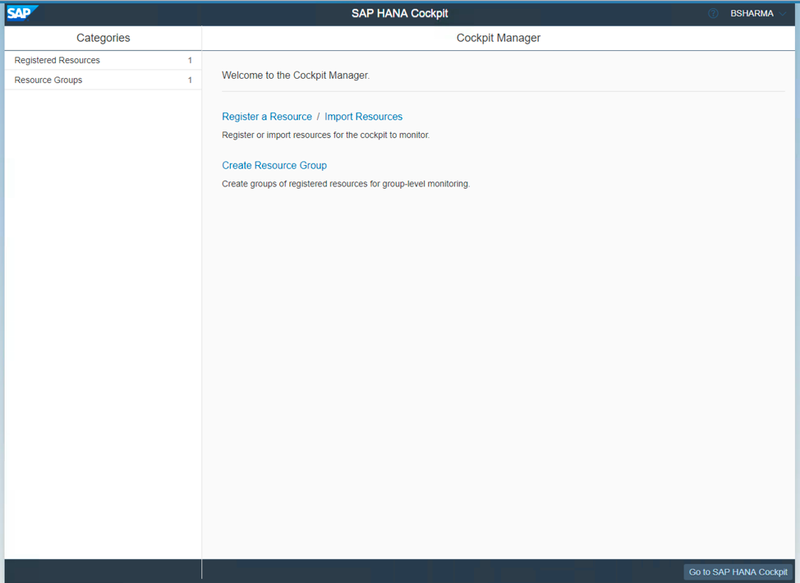 Login SAP HANA Cockpit manager https://fullhostname:510024/ with Cockpit user. We will see the cockpit manager welcome screen. Only the features available according to the assigned authorizations, for e.g., to create a resource group and register a resource. Click on ‘Create Resource Group’ to create a resource group for group-level monitoring. Enter the name for resource group according to the planned strategy to manage the customer landscape. For e.g. 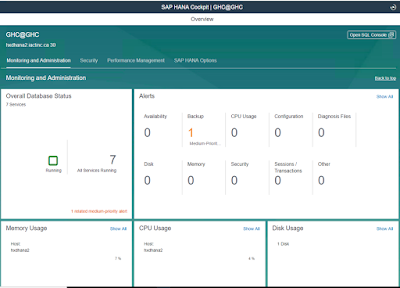 we created a group BW_BPC_NONPRD to monitor or manage all BW-BPC Non production HANA databases. There are no resources registered yet, so continue by clicking ‘Step 2’. Click ‘add cockpit users’ button to browse available users. Select the new cockpit user, for e.g. bsharma. This user will have access to the resource group BW_BPC_NONPRD so as to monitor and manage all the resources within the group. Click the button – Create Group – to create the resource group. 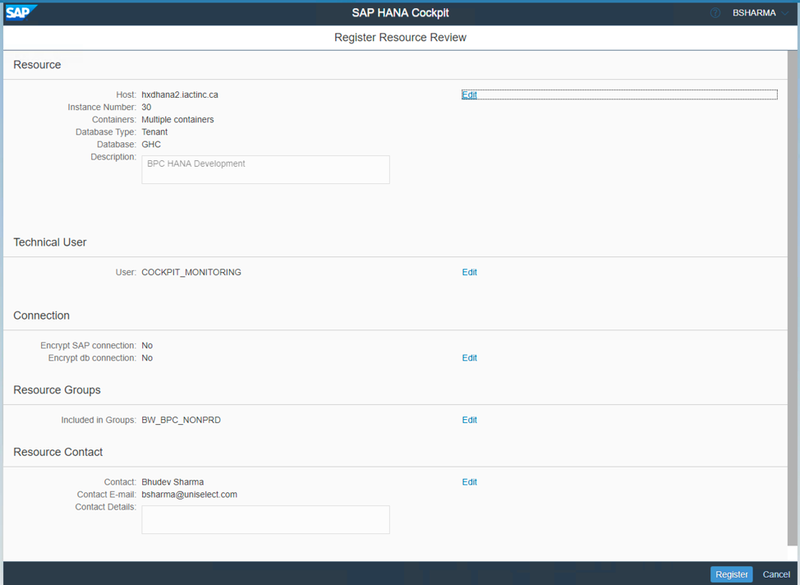 Confirmation screen should display the details for new created resource group BW_BPC_NONPRD. 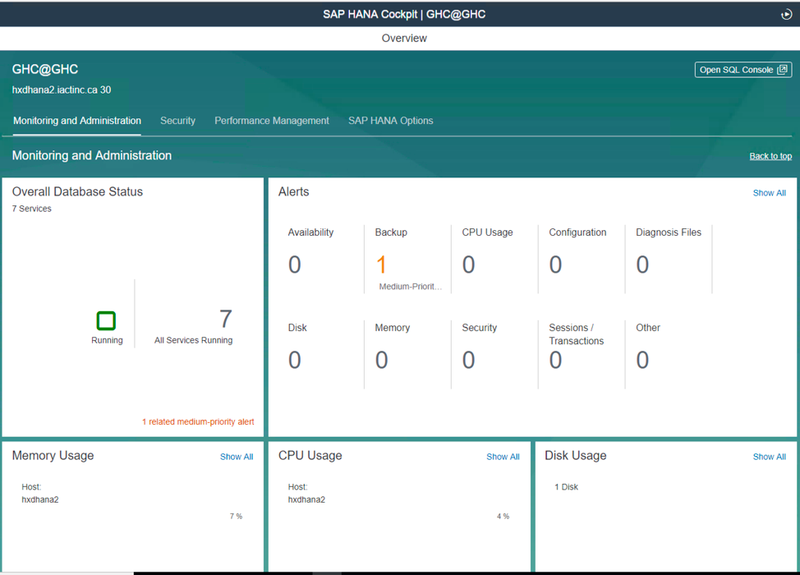 As we discussed before, a resource is the remote HANA database which we want to monitor and manage via SAP HANA Cockpit 2.0. Again login to cockpit manager and go to home page. Click on ‘Register a Resource’. ◈ Database Name: Database name must be provided if we are trying to add a tenant database as a resource. Select whether to encrypt the connection or not. Check mark the options and continue to step 4. 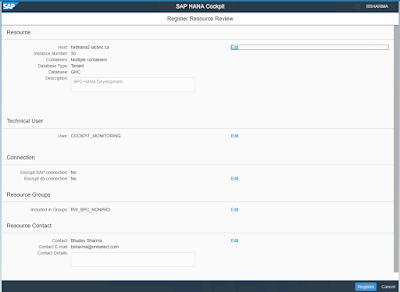 Click – add group – to assign a particular resource group. So, the resource which we are trying to register will be a member of the resource group BW_BPC_NONPRD. Select BW_BPC_NONPRD resource group, which we created before. Continue with the selection after specifying the resource group. Provide contact details for the person responsible for the resource/database and click Review. Click the button – Register – to register the Resource. ‘Resource Details’ will show the details about the registered resource. 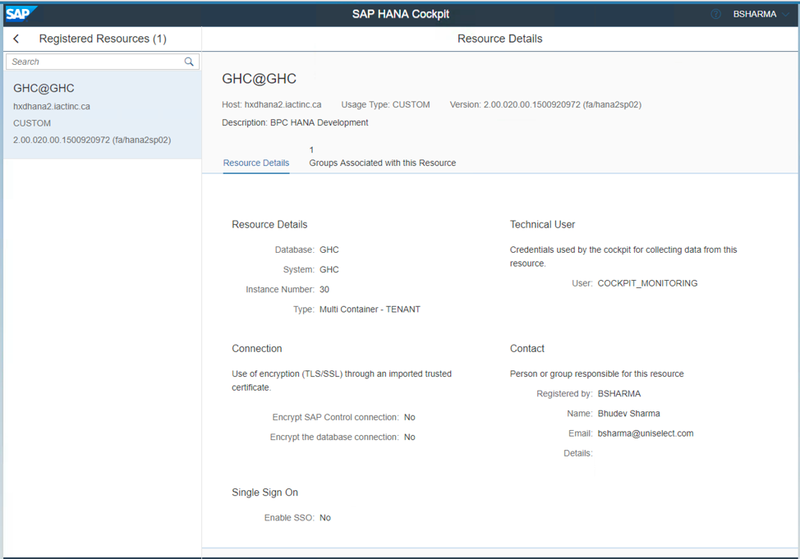 Remote HANA tenant database has been registered a resource GHC@GHC in SAP HANA Cockpit 2.0. 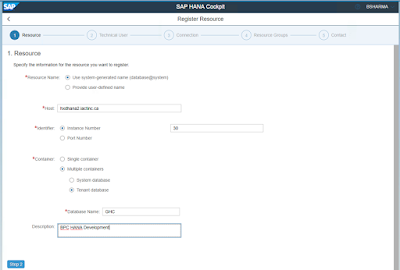 Go to – Resources – to see the details for remote HANA tenant database. Resource state should be ‘Running’. Click on Resource, for e.g. GHC@GHC, to monitor the resource / HANA tenant database.